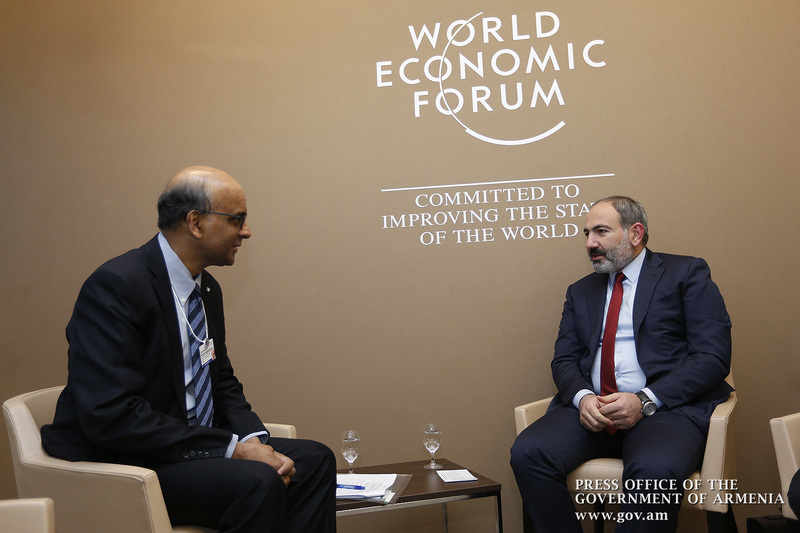 Prime Minister Nikol Pashinyan met with Deputy Prime Minister of Singapore Tharman Shanmugaratnam in Davos. Noting that Armenia is interested in the continued development of cooperation with Singapore in various fields, Nikol Pashinyan said Singapore’s development experience is exemplary for our country. The Prime Minister stressed the importance of continued development of commercial and economic relations, as well as cooperation between respective business communities. With reference to business climate improvement in our country, Nikol Pashinyan stressed the need for giving Singapore businessmen indications about the possibilities of implementing investment projects in Armenia. The interlocutors discussed the export possibilities of various Armenia products, such as brandy, wine, beer, fruit juices and other products to Singapore. 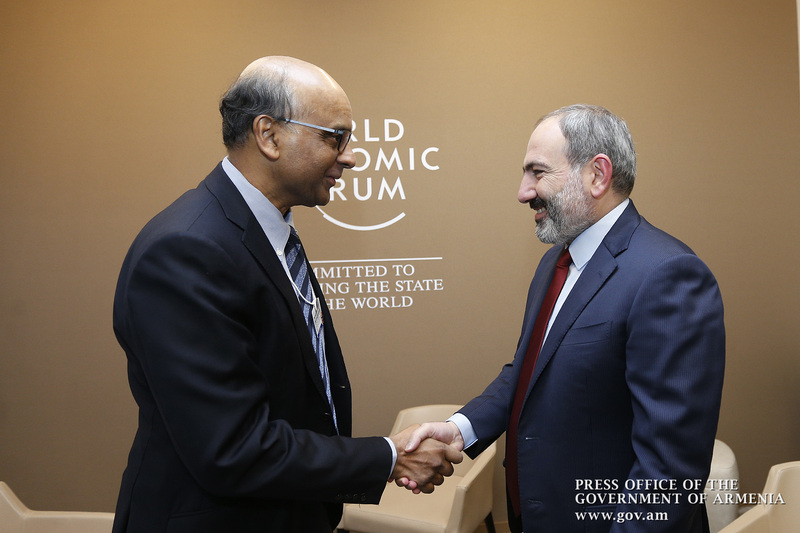 Tharman Shanmugaratnam noted that the government of his country understands the importance of developing cooperation with Armenia, given the recent positive changes in Armenia. He conveyed to Nikol Pashinyan the invitation of Singapore’s Prime Minister to visit Singapore and stressed that it could give a new impetus to bilateral cooperation in different directions. He noted that the Armenians are considered to be good citizens in his country. 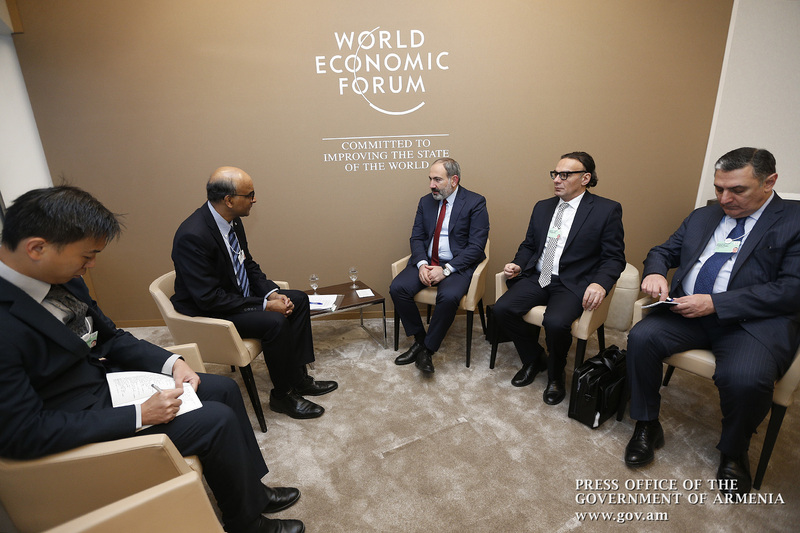 Tharman Shanmugaratnam assured that he will convey to the business community of his country the possibilities of implementing investment projects in Armenia. At the same time, he considered ambitious the Armenian government’s programs aimed at fighting corruption, improving the business climate and modernizing the management system. In this context, the parties agreed to continue discussions on cooperation in these areas. Nikol Pashinyan advised that a World IT Congress will be held in Armenia in October and stressed the importance of Singapore-based companies’ participation in this important event. The parties discussed issues related to the implementation of concrete projects in tourism, environmental protection and aviation. The interlocutors also discussed issues related to the development and expansion of cooperation between the Eurasian Economic Union and Singapore.